Preparing crape myrtle for bareroot planting. Bare root plants. Pot-bound plants can resist water and cause the growth of deformed and unhealthy root development. 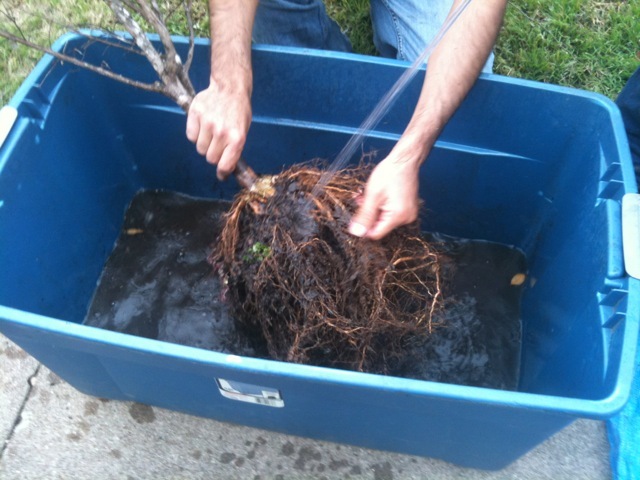 Soak root balls in water for at least 30 minutes or until they are thoroughly saturated. 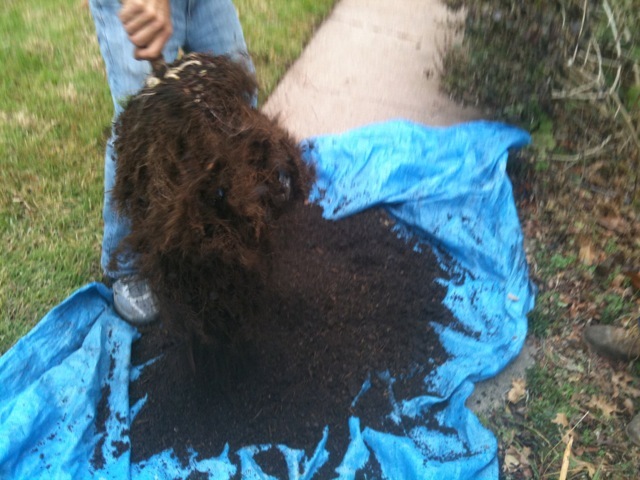 Remove most if not all of the soil and synthetic fertilizer pellets. Spread the roots out naturally radiating and then cover them with prepared bed soil. If you don’t want to go the bare root route, dip plant balls into water and install sopping wet root balls into moist beds. Add Garrett Juice to the water for best results. It's Time to Bare All! According to Dr. Douglas F. Welsh, a professor and extension horticulturist at Texas A&M University, all bare root plants, including roses and pecan and fruit trees, should be planted in late winter when they are completely dormant. Bare root fruit trees are dormant trees that are dug up and stored in cold storage without soil around the roots. The trees weigh less, which is beneficial when shipping. Once planted in the ground, the fruit trees will start to grow when watered. When planting a bare root fruit tree at home, consider variety selection. In order to set fruit, most trees require a minimum number of hours of temperatures within the range of 32° to 45° F. This temperature range is called "chill hour requirement," and may vary widely for varieties within a given fruit class. Be sure that the trees receive adequate moisture during the growing season. Check with your local extension agent to find out which variety grows best in your county, or to determine chill hour requirements. Growing Bare Root Trees: The Missouri Gravel Beds. The Missouri Gravel Bed (MGB) is a method of handling bare root nursery stock in which the plants are placed with their roots in an irrigated bed of gravel and held for up to 6 months before planting. It is not a growing method, but can be used by growers, nurseries, and arborists to extend the planting season and to greatly simplify the handling of bare root stock. It also shows promise as a method for heeling in B&B stock. The key is that root growth in gravel is very fibrous and unlike mulch or sand, very few roots are damaged when plants are pulled from the gravel. The MGB was developed at the University of Missouri Horticulture Research Center about 1985. In the initial test, 20 - 4' to 6' bare root Washington Hawthorn trees, after 8 weeks in aerated water, survived planting in midsummer. While aerated water grows good roots, it does not provide any support, creating problems in plant handling. The studies since 1986 have used creek gravel as the support and root growth medium. Over the past 10 years, many species have been tested in the MGB including ornamental pears, redbuds, flowering dogwood, lindens, maples, crabapples and roses. A test at Sherman Nursery in 1994 expanded the number of species to well over 30. The survival of MGB plants has been as good as or better than container grown or B&B materials. There is nothing high tech about MGB. All that is required is a layer of gravel and a time clock controlled irrigation system. Plants are simply placed with their roots in the gravel, and allowed to grow until time to plant. A surface application of slow release fertilizer has proven effective in keeping the plants green. Plastic Plumbing Products, Grover, MO, has developed a drip irrigation kit designed for a 4' x 25' bed. Modules can be added as needed, depending on the bed size desired. The kit includes a time clock and solenoid valve and all of the required irrigation tubing and fittings. Municipal arborists may be hesitant at first to buy plants with their roots out in the open. However, the main reason why MGB works so well is that actively growing roots are placed in direct contact with the soil. When plants are removed from the gravel, spraying the roots with water and putting them in a plastic bag is sufficient. The plants should be planted within a day or two. If the top growth is very soft, it may be advisable to wrap the whole plant in plastic. Five or six times as many MGB plants will fit in a car as container plants of the same size. Layout: The beds can be constructed in 4' x 25' modules using 1/2" gravel with about 10% sand (passing a #10 screen), 14" to 18" deep. Railroad ties or dimension lumber can be used to make the bed look tidy. The drip irrigation lines should be spaced 1 foot apart and running the length of the bed from a header across the 4' width. Emitters (0.5 gph) are spaced every 6" in the line. Bed Management: Plants are placed in the bed by digging a trench in the gravel and then shoveling gravel back over the roots. It is helpful to wet the gravel before making the trench. Spacing of plants in the bed will depend on the plant size. Staggered rows work well for trees with 6'- 8' trees as close as 16" in the row. 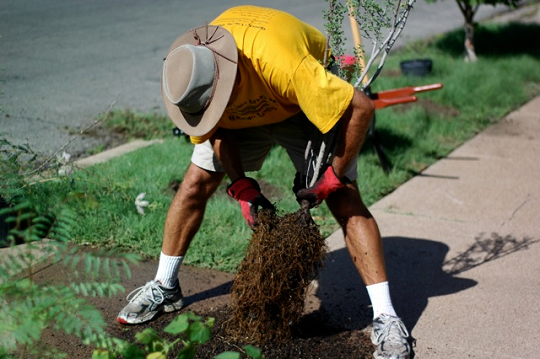 Up to 100 trees and shrubs can be placed in a bed. It is best to get the bed set up by mid April to allow for good root development before the onset of hot temperatures. Until plants leaf out, watering I is not critical. Set the time clock to water two or three times a day for about 5 minutes. When the plants have begun to flush, set the time clock to irrigate about 3 or 4 minutes every hour during the daylight hours. Later, when the growth has slowed, the irrigation frequency can be reduced to once or twice per day. Let the plants be your guide. Slow release fertilizer granules should be applied to the surface of the gravel. Use a rate similar to that for topdressing container stock but apply at monthly intervals. Planting: When removing plants from the gravel, lay the plants on a piece of plastic and spray them with water. A bundle of five or ten plants can be wrapped up and tied with twine. If the bundle is not opened and kept in a cool place, the plants can be kept for several days before planting. Dipping the roots in TerraSorb gel does not seem to provide any real benefit and may actually interfere with root growth in some cases. It is best to check occasionally and spray the roots with water. Later in the season, after the top growth has hardened, the roots can be placed in a bag and the tops left exposed. Water added to the planting hole is often the only care required as the roots begin taking up water from the backfill soil immediately. Chris is a Professor of Horticulture at the University of Missouri - Columbia. Chris can be contacted at (573) 882-9630. Plastic Plumbing Products can be contacted at (314) 458-2226.